Jennifer Montagu Art Historian specializing in Italian Baroque. Sculpture before 1900, Toledo Museum of Art, Ohio. Sculpture, particularly Italian, French and English. Tom Nickson Associate Dean, Lecturer in Medieval Art, Courtauld Institute of Art. Andrea Bacchi Director, Federico Zeri Foundation, Bologna. Colin Bailey Director, Morgan Library and Museum, New York. Scott Nethersole Senior Lecturer in Italian Renaissance Art, The Courtauld Institute of Art, London. Gianni Papi Art Historian specializing in Caravaggio. Edward Payne Senior Curator, Spanish Art, Auckland Castle Trust. Studies in British Art, London. Xavier F. Salomon Peter Jay Sharp Chief Curator, The Frick Collection, New York. Salvador Salort-Pons Director, President & CEO, Detroit Institute of Arts. Timothy Schroder Art Historian specializing in European silver and goldsmiths’ work. Till-Holger Borchert Director, Musea Brugge. & Glass, Victoria & Albert Museum, London. Bruce Boucher Director, Sir John Soane’s Museum, London. European Art, The Museum of Fine Arts, Houston. Pippa Shirley Head of Collections, Waddesdon Manor. Jack Soultanian Conservator, The Metropolitan Museum of Art, New York. Nicola Spinosa Former Director of Museo di Capodimonte, Naples. Carl Strehlke Adjunct Emeritus, Philadelphia Museum of Art. Holly Trusted Senior Curator of Sculpture, Victoria & Albert Museum, London. Xavier Bray Director, The Wallace Collection, London. Benjamin van Beneden Director, Rubenshuis, Antwerp. Jeremy Warren Honorary Curator of Sculpture, Ashmolean Museum, Oxford. 1500, The National Gallery, London. Peter Cherry Associate Professor, Trinity College Dublin. School of Fine Art, University of Leeds. Matthias Wivel Curator, Sixteenth-Century Italian Paintings, The National Gallery, London. Yao-Fen You Associate Curator of European Sculpture and Decorative Arts, Detroit Institute of Arts. Barbara Lasic Lecturer in Art History, University of Buckingham. European Painting and Sculpture, Los Angeles County Museum of Art. Submissions should be emailed to: journal@colnaghi.com. Age, Università degli studi della Campania “Luigi Vanvitelli”, Naples. (including endnotes) and include high resolution, comparative images. Catherine Whistler Keeper of Western Art, Ashmolean Museum, Oxford. Rosario Coppel Art Historian specializing in Spanish Sculpture. Institute for Cultural Heritage (KIK/IRPA), Brussels. broader context of the artist’s oeuvre, provide visual analysis and comparative images. mission. If you believe any material has been included in this publication improperly, please contact the Foundation. permission in writing from The Colnaghi Foundation. volume in which his or her article appears. Manuscripts should be submitted as double-spaced Word files. end of the text file. 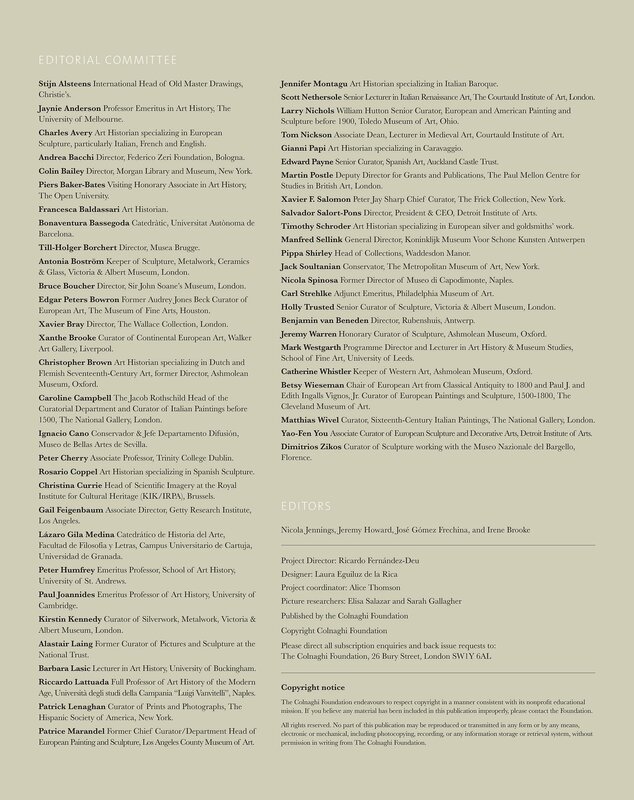 electronic editions of the Journal. Height precedes width and then depth in dimensions cited. good quality and in good condition. picture’s orientation, and any instructions for cropping. photographic material and reproduction rights.